PGDM – Retail Management organised a session on “B-Schools to Corporate” on 8th July 2017 for the students of PGDM-RM (Batch 2017-19). The session was conducted by Mr. Vikul Goyal, General Manager, Radico Khaitan. The session was organised for the new batch of students who haev just joined the institute. The session focussed on the journey of a student from the B-school to a manager in corporate. He emphasised that corporate environment is made up of group of people who act as a single entity and this entity is majorly made up of mind work, strategies & decision making power of the managers. They are the back bone of the corporates. The B-Schools give a flexible approach and adaptability to the students with the market awareness and sector specific knowledge & skills. 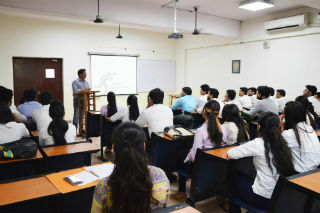 These B-Schools also update the course curriculum based on the changing requirements and expectations of the industry. They take various measures in terms of organising corporate interaction through business leaders lectures, workshops, case studies, live projects, Internships, industrial visits etc. to sync the skills that industry is looking for in the managers. 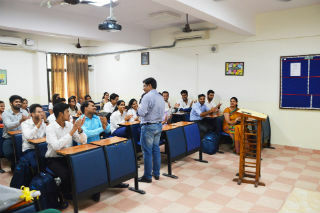 Mr. Vikul Goyal shared his knowledge on corporate requirements and expectations, corporate experience with the students. In his session he taught the student to overcome the fears, doubts & misconception with regard to the corporate world. His lecture made the student more practical about the industry requirements. All the students enjoyed the session and wanted more such sessions in future.